While incidents resulting from wrong-way driving make up a small percentage of the overall crashes that take place on our highways, they are far more likely to result in fatalities. We are working aggressively to add safety features to reduce the occurrence of wrong-day driving. Nationally, about 360 people die each year in one of these crashes. Here in Rhode Island, we have witnessed 10 fatal crashes, resulting 13 deaths since 2008. Alcohol impairment is a leading factor for wrong-way crashes, and most happen on weekends and during evening and overnight hours. All of Rhode Island's limited access highways were targeted for improved signage and pavement markings to clearly distinguish exit ramps from entrance ramps and prevent confusion. 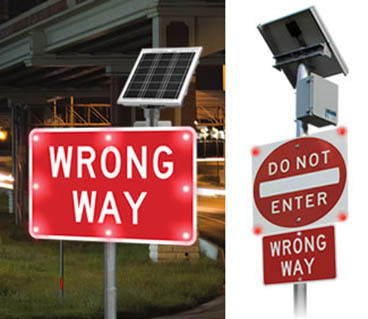 At the two dozen high-risk areas, most in the Providence metropolitan area, new detection systems sense if a driver has entered a highway off-ramp, and activate a series of flashing signs. It will also notify the Rhode Island State Police that someone is driving the wrong way on the road, take a picture of the vehicle, and display a message on our overhead signs to warn drivers heading in the opposite direction. Our plan is modeled on a similar project in San Antonio, Texas, where 29 flashing signs were installed along a major highway. Within a year, there was a 30 percent reduction in wrong-way driving incidents.